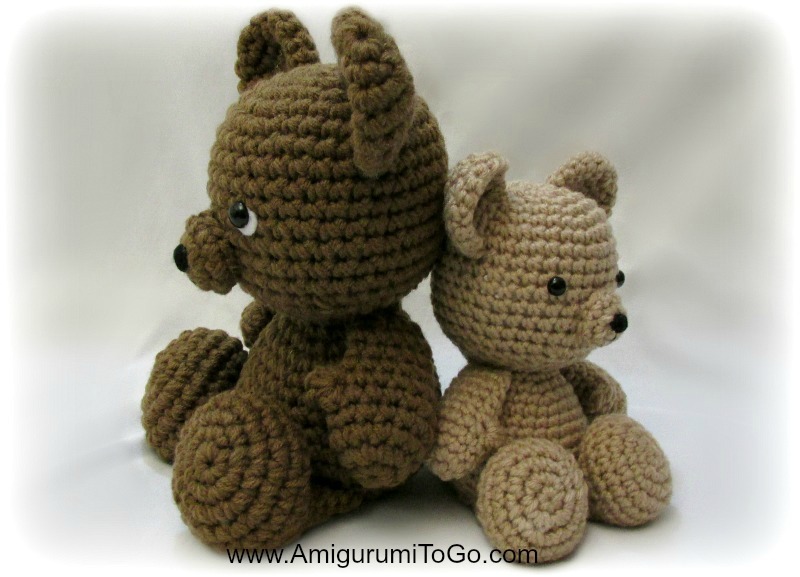 Ever look at an amigurumi you've made and wish it was bigger? I have. When I first learned to crochet I realized very quickly that if I held 2 strands of yarn together and use a larger hook that I would get a piece quite a bit larger than the original. You can also use a bulky or heavier weight yarn and larger hook. Up first is my little basic bear. Using worsted weight yarn and a 4mm hook we get the cute size of 6 inches tall in a sitting position. Double the yarn, (hold 2 strands together), use a 5mm hook and look at the difference! The bear gained in height and in size and is almost 8.5 inches tall. You get a 2 for 1 deal with this pattern! Using worsted weight yarn and a 3.75mm hook the blue Totoro is just 3 inches tall. So cute! 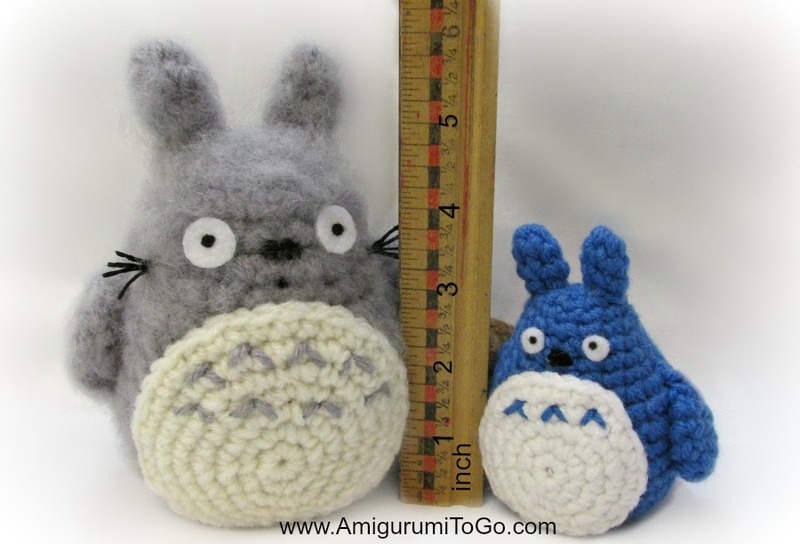 If you hold 2 strands of worsted weight yarn with a 5mm hook then he grows to be the big 5 inch Grey Totoro. That one saved me time by not having to write a separate pattern! Using a 4.5mm hook with worsted weight yarn the smaller elephant is 8 inches tall but use a 6mm hook and 2 strands together and he grows just a bit taller than the 12 inch ruler, wow! It can get a little tiring on the fingers to hold 2 strands together as it takes a little more strength to keep the stitches tight so you may need to rest a bit in between pieces. Hold the strands together and crochet normally as you would if you were using one strand. You don't have to do anything fancy, just hold them together. You can use 2 rolls and keep them side by side as you crochet or you can use both ends of the roll. That's what I do. The one end is easy to find of course but the other end you might have to fish for, especially if you buy the big jumbo rolls like I do. There's been a few times where I've gotten lucky and the other end is just peeking out the end of the roll then other times I have to pull a big bunch of it out as pictured below then unravel that bunch to get the other end. It's just the luck of the draw. I hope this post has helped you visualize the big difference hook size and doubling the yarn can make. I hope you enjoy the patterns! Post pictures on my facebook page Amigurumi Freely. Or post them on instagram with the hashtag Sharon_Ojala. Heel interessant bericht waarvoor dank !!! That's awesome! Would it be possible for you to include in your video a small demo on what it would look like crocheting with 2 strands? I'm a visual creature myself, so seeing something done makes it easier to do. I made an elephant exactly the way you made it. 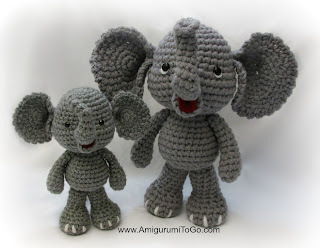 In your collection is the elephant shorter than the monkey or lion, mine is and I used the same types of yarn and hooks and my elephant is shorter! Please answer is he shorter? I was wondering: If you were to do this with the lion pattern, would you just use two strands of yarn in each stitch while doing the mane, as well? I haven't tried that myself but my guess is no. If you are rooting the yarn and after a section is done it's starting to look sparse then do the 2 strands at once and just go back over what you've done and put in more strands. Thanks! I'm starting one now, so I'll be sure to post it to Facebook when I'm finished and let you know what worked best! 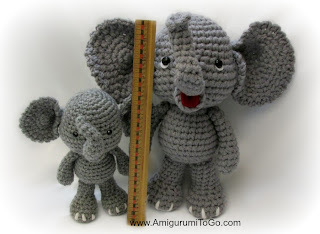 Hi, may I know if the size of the crochet hook can be doubled if I use double strand of the yarn,pls? I add the size of hook I used in this post..
Is there any way to make patterns smaller? Can you make patterns smaller in any other way? what about shrinking the pattern? but still using the same yarn? you can't do it using the same yarn without rewriting the pattern but you can shrink it a whole lot by using a smaller hook and lighter weight yarn. Scroll up and look to the right for the search bar. Type in "Monkey" I have a 2 foot monkey called Darcy. If you hold one strand of yarn you'll get a monkey about 18 inches. There's also the Little Bigfoot monkey that about 8 inches tall. You can enlarge that one by holding 2 strands of yarn together. There's a couple other monkey patterns as well. GM love your patterns started amigurumi from your YouTube. Did you ever post a video of your technique for making the dolls bigger if so could you tell me where I can find it. Thank You. My Grandson loves Sharks...... do you think you could make one??? ?